Colin T. Trevorrow (US: /trəˈvɑːroʊ/; born September 13, 1976) is an American film director and screenwriter. He directed the indie film Safety Not Guaranteed (2012) and the blockbuster film Jurassic World (2015), and also co-wrote the script to Jurassic World and its 2018 sequel. Trevorrow was born on September 13, 1976 in San Francisco, California. He was raised in Oakland, California. His father was a musician in a country rock band and his mother was a photographer who also operated a day-care center. He is Jewish on his mother's side. As a boy, he sang in the chorus of the San Francisco Opera. As a teenager, Trevorrow won awards from the Mill Valley Film Festival and the San Francisco Youth Film Festival. Trevorrow graduated from Piedmont High School in Piedmont, California, and later graduated from New York University's Tisch School of the Arts in 1999. In 2002, he wrote and directed his first short film, Home Base; as of 2012, it had received over 20 million hits online. Trevorrow's first theatrical release was with Reality Show, a 2004 documentary film about the failed production of a reality television show. Trevorrow sold his first spec script titled Tester to DreamWorks in 2006. In 2008, he paired up with Derek Connolly, ten years after they had first met as NYU students while working as interns on Saturday Night Live, to write a buddy cop film script called Cocked and Loaded. Trevorrow said that the experience was so enjoyable that he decided to give up solo screenwriting and work with Connolly. 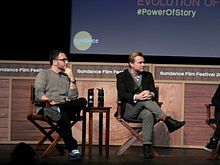 Trevorrow (left) and Christopher Nolan at the 2016 Sundance Film Festival. In 2012, Trevorrow directed Safety Not Guaranteed, a film inspired by a classified advertisement which ran in a 1997 issue of Backwoods Home Magazine that read: "Wanted: Someone to go back in time with me. This is not a joke. Must bring your own weapons. I have only done this once before. Safety Not Guaranteed." The script was by Connolly, who intended for Trevorrow to direct it. The film received various accolades, including a nomination for Trevorrow for the Independent Spirit Award for Best First Feature. The film was nominated for the Grand Jury Prize at Sundance, where it picked up the Waldo Salt Screenwriting Award. After the release of Safety Not Guaranteed, Trevorrow and Connolly were hired by the Walt Disney Company to write an as-yet unmade remake of the film Flight of the Navigator (1986). Trevorrow co-wrote and directed Jurassic World (2015), and also provided his voice for the film's character of Mr. DNA. Connolly and Trevorrow also co-wrote the screenplay for its sequel, Jurassic World: Fallen Kingdom, which was released in June 2018 and for which Trevorrow is an executive producer. After Jurassic World, Trevorrow next directed The Book of Henry, which was written by Gregg Hurwitz. The film was released by Focus Features on June 16, 2017 to generally negative reviews, although Trevorrow stood by the film. In March 2015, it was announced that Trevorrow would be directing the sci-fi thriller film Intelligent Life, which was bought by DreamWorks. Trevorrow wrote the screenplay with Connolly, while Trevorrow, Frank Marshall, Big Beach, and Spielberg's Amblin Entertainment were announced as producing the film. While there has been other production news since, including Ava DuVernay being attached to direct, as of May 2018 the film has not entered into production. In August 2015, Walt Disney Studios chairman Alan Horn announced that Trevorrow would direct Star Wars: The Rise of Skywalker (2019). Trevorrow and Connolly subsequently began writing the script for the film; however, in August 2017, writer Jack Thorne was brought in to rewrite the script due to dissatisfaction by Lucasfilm with their script. By September 2017, Trevorrow left the project due to creative differences and was replaced as director by Star Wars: The Force Awakens director J.J. Abrams who has co-written the script with Chris Terrio. On March 30, 2018 it was announced that Trevorrow would be returning to the Jurassic Park franchise to direct Jurassic World 3 (2021). Trevorrow lives with his wife, Isabelle, and two children in England. ^ a b "Colin T. Trevorrow, born 09/13/1976". California Birth Index. Retrieved May 10, 2016. ^ Trevorrow, Colin (June 7, 2012). "Colin Trevorrow SIFF Interview - Safety Not Guaranteed - The MacGuffin" (Interview). Interviewed by Spencer Fornaciari. Retrieved January 6, 2016. ^ a b "Celebrity Jews". j. (newspaper). Retrieved 28 June 2015. ^ a b c Barnes, Brooks (June 3, 2015). "'Jurassic World' Puts Colin Trevorrow in the Driver's Seat". The New York Times. Retrieved May 10, 2016. ^ Douglas, Edward (June 6, 2012). "Interview: Safety Not Guaranteed's Colin Trevorrow & Jake Johnson". ComingSoon.net. Retrieved September 17, 2015. ^ Blair, Iain (June 1, 2015). "Director's Chair: Colin Trevorrow - 'Jurassic World'". Post magazine. Retrieved May 3, 2016. ^ Bloom, Nate (June 10, 2015). "Jews in the News: Ahmed Zayat, Eric Balfour and Ashley Tisdale". Jewish Federation of Tampa. ^ a b "Teen Filmmakers" (PDF). Discovery Education. 1994. pp. 6, 11. Retrieved May 10, 2016. ^ "Piedmont Arts Center Boasts Successful First Year". Piedmont Civic Association (PCA). January 20, 2013. Retrieved May 10, 2016. ^ Sneider, Jeff (February 6, 2012). "Tisch School alum make Sundance impressions". Variety. Retrieved January 25, 2013. ^ a b c "Colin Trevorrow". Independent Spirit Awards. Archived from the original on December 6, 2012. Retrieved January 25, 2013. ^ Vizcarrondo, Sara Maria (June 12, 2012). "Little Time Machines Everywhere: Director Colin Trevorrow on 'Safety Not Guaranteed'". BoxOffice. Retrieved December 3, 2015. ^ Connelly, Brendon (December 20, 2012). "Safety Not Guaranteed's Colin Trevorrow On His Old Scripts That Might Yet Get Made". BleedingCool.com. Retrieved January 25, 2013. ^ "Meet the 'Jurassic World' Dinosaurs! - Bloody Disgusting". bloody-disgusting.com. ^ a b Jones, Alison (January 4, 2013). "Colin Trevorrow has a fresh take on time travelling". Birmingham Mail. Retrieved January 25, 2013. ^ "Vertigo high on Safety Not Guaranteed". Screen. Retrieved 2017-09-25. ^ Sneider, Jeff (November 27, 2012). "Disney taps 'Safety' duo for 'Navigator' rewrite". Variety. Retrieved January 25, 2013. ^ Fleming, Jr., Mike (March 14, 2013). "Colin Trevorrow To Helm 'Jurassic Park 4' For Universal And Steven Spielberg". Deadline. Retrieved September 5, 2017. ^ "Jurassic World! New Look at the Dinosaurs - Dread Central". March 1, 2015. ^ Anderton, Ethan (June 15, 2015). "'Jurassic World' Easter Eggs: Did You Catch These 'Jurassic Park' References? (page 2)". /Film. Retrieved March 28, 2018. ^ Ryan, Mike (June 8, 2015). "'Jurassic World' Director Colin Trevorrow Explains Why He Won't Be Making Another 'Jurassic World'". Uproxx. Retrieved March 28, 2018. ^ Cabin, Chris (July 21, 2016). "'Jurassic World 2' Hawaii Production Gets 2017 Start Date". Collider.com. Retrieved June 14, 2017. ^ Rebecca Ford (July 23, 2015). "'Jurassic World 2' Set for 2018". The Hollywood Reporter. (Prometheus Global Media). Retrieved June 14, 2017. ^ Kit, Borys (March 30, 2015). "'Jurassic World' Director Colin Trevorrow Tackling 'Book of Henry'". The Hollywood Reporter. Retrieved March 31, 2015. ^ D'Alessandro, Anthony (May 31, 2016). "Colin Trevorrow's The Book Of Henry to Hit Theaters in September". Deadline. Retrieved June 1, 2016. ^ Limbachia, Dixie (June 26, 2017). "Colin Trevorrow Responds to Negative 'Book of Henry' Reviews: 'I Do Stand by the Movie'". Variety. Retrieved 29 May 2018. ^ a b Kit, Borys (March 6, 2015). "'Jurassic World' Director Colin Trevorrow Tackling Sci-Fi Thriller 'Intelligent Life' (Exclusive)". The Hollywood Reporter. Retrieved February 9, 2016. ^ "Ava DuVernay Exits Sci-Fi Film 'Intelligent Life'". May 4, 2016. ^ Rebecca, Ford (August 15, 2015). "'Star Wars: Episode IX' Sets 'Jurassic World' Director Colin Trevorrow to Helm". The Hollywood Reporter. Retrieved August 16, 2015. ^ Chitwood, Adam (January 12, 2016). "'Star Wars: Episode IX' Director Colin Trevorrow Promises "Satisfying" Answer to Rey Theories". Collider. Retrieved September 6, 2017. ^ "The Man Re-Writing Colin Trevorrow's Star Wars Is Fantasy's Secret Weapon". Vanity Fair. August 2, 2017. ^ "'Star Wars: Episode IX' Gets a New Writer (Exclusive)". The Hollywood Reporter. August 1, 2017. ^ "J.J. Abrams to Replace Colin Trevorrow as Director of 'Star Wars: Episode IX'". Variety. September 12, 2017. ^ "Colin Trevorrow to Direct 'Jurassic World 3'". The Hollywood Reporter. Retrieved 2018-07-07. ^ O'Connor, Clint (June 9, 2017). "Director Colin Trevorrow hits the road for 'The Book of Henry'". Akron Beacon Journal. Retrieved August 29, 2018. ^ Stack, Tim. "'Steven Spielberg: Colin Trevorrow will direct third Jurassic World". entertainmentweekly.com. Retrieved 30 March 2018. ^ Kroll, Justin. "'Jurassic World 3' to Hit Theaters in June 2021". Variety.com. Retrieved 21 February 2018.